Richly rooted in the beginnings of spinning wheel history, the Polonaise was masterfully designed and engineered with longevity in mind. This enticingly beautiful, traditional Norwegian style wheel, captures the fashion and refinement of wheels historically found in the Baltic areas of Poland and the Scandinavian Peninsula. 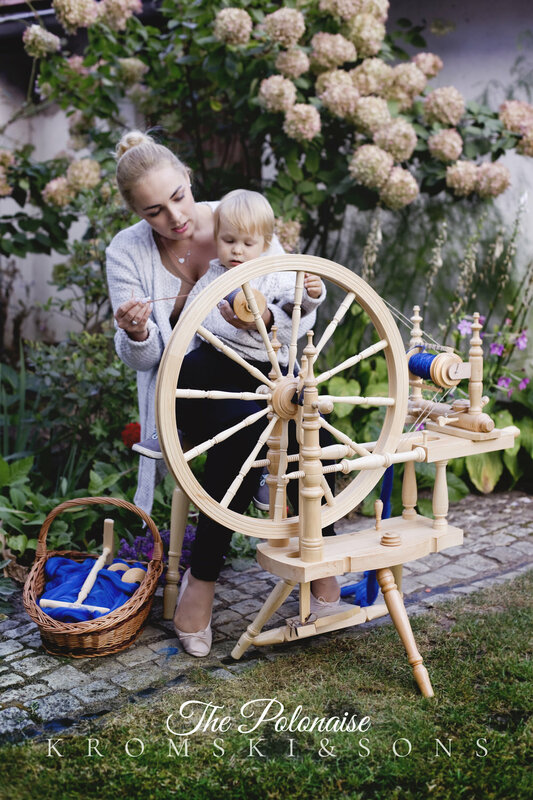 Boasting a magnificent yet graceful 24” drive wheel that is suspended by pin and socket bearings, the Polonaise spins with virtually effortless treadling. This feature, along with an expansive range of speed/ratio options to choose from, gives spinners of all experience levels more flexibility than ever before offered in a wheel this large. The fully functioning, wooden wheel-adjusting and tension adjusting screws permit each individual spinner to precisely calibrate the wheel angle and flyer alignment of this model. Exceptional details and craftsmanship make the Polonaise one of the most desired wheels produced by Kromski. With all of the eloquent features and dependable performance that the Polonaise delivers, it is sure to become a treasured heirloom and conversation piece for years to come. Looking for accessories to go with your Polonaise? *Yippee, $100 Instant Shopping Spree with the Purchase of the Polonaise! Please note on form at check out which in stock items up to the value of your shopping spree you would like to receive. If you would like an Item that is more expensive than your shopping spree contact me and I will be happy to make you a Custom Order.